By Caz | November 30, 2018 | This post may contain affiliate links, which means we may receive a small commission, at no cost to you, if you make a purchase through a link. Read our Disclosure. Savannah inquisitively asked after a few strokes of treading water. I was holding on to her, our legs wrapped around a noodle to help us stay afloat. 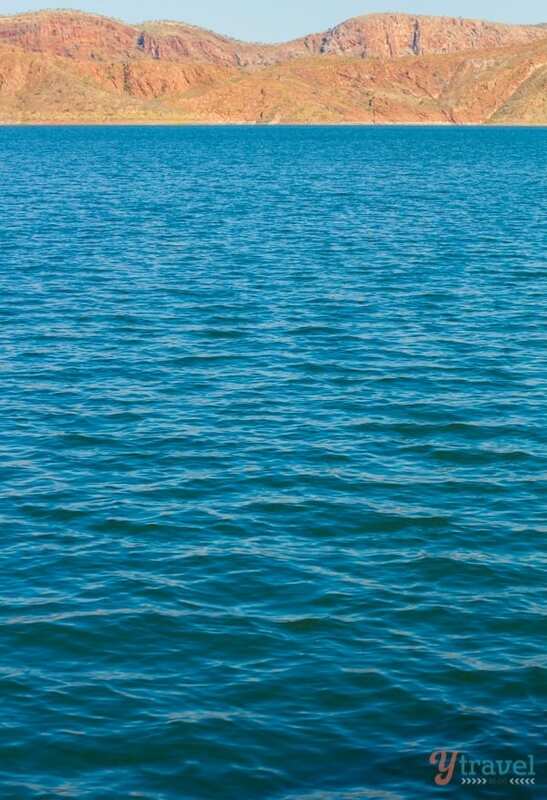 Freshwater doesn’t have the buoyancy of salt water. Especially when deep water is below you and you’re relying on floating pretty heavily. She looked at me like I was mad. The months of my lectures about never going near the river’s edge because of saltwater crocodiles had obviously sunken in. So we kept swimming. She smiled and laughed and just let her normal fear of the water melt away. 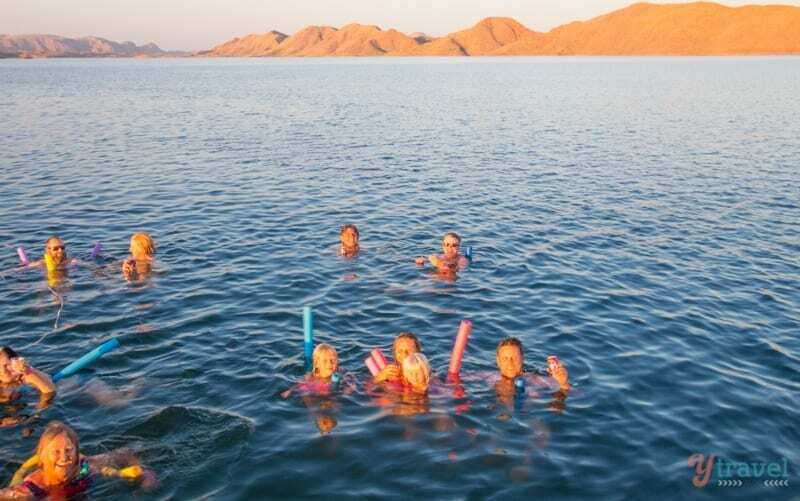 We’d just jumped into the middle of Lake Argyle, the largest artificial lake in Australia by volume. The sun was setting and I was feeling a little euphoric. Our tour guide, Josh was tossing out beers and passing glasses of wine to us all as we floated, enjoying the refreshing swim – even at 25 degrees the water was cool to the 35 degree baking hot Kimberley day. The sun was going down behind the red sandstone escarpment and we were swimming in a pool of water that is home to over 25,000 freshwater crocodiles. 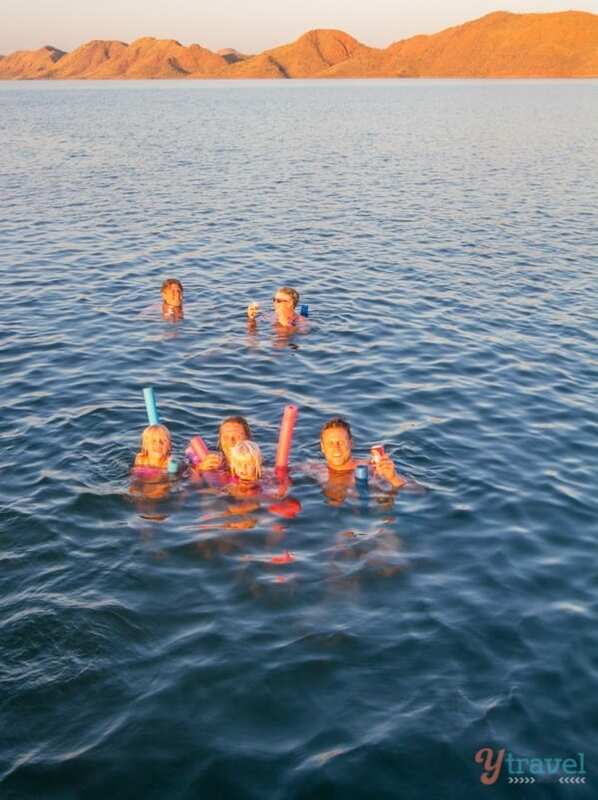 I think swimming in Lake Argyle at sunset was one of the most liberating and coolest moments of my life. And here I was experiencing it with my two daughters. Only hours before arriving in Lake Argyle, I was ready to quit traveling. The challenges of the road were getting on top of me. But, this was the interruption to show me why it was worth sticking it out. 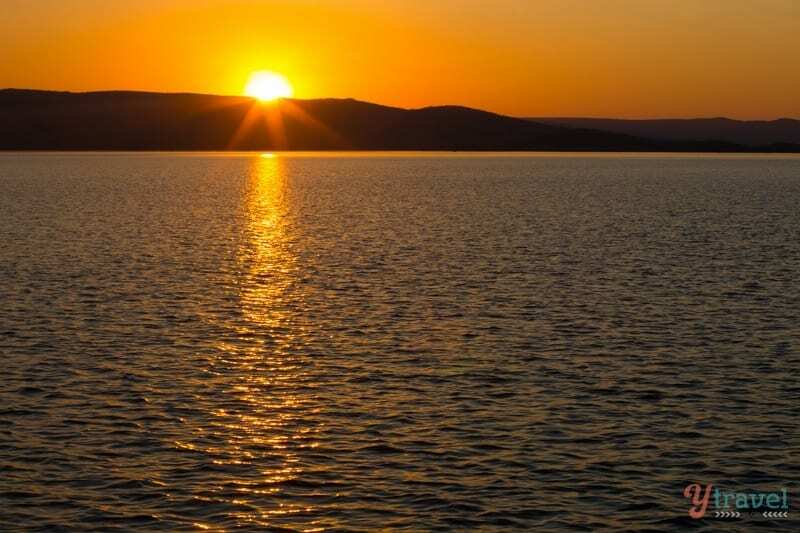 The sunset cruise with Lake Argyle tours is a bucket list experience. 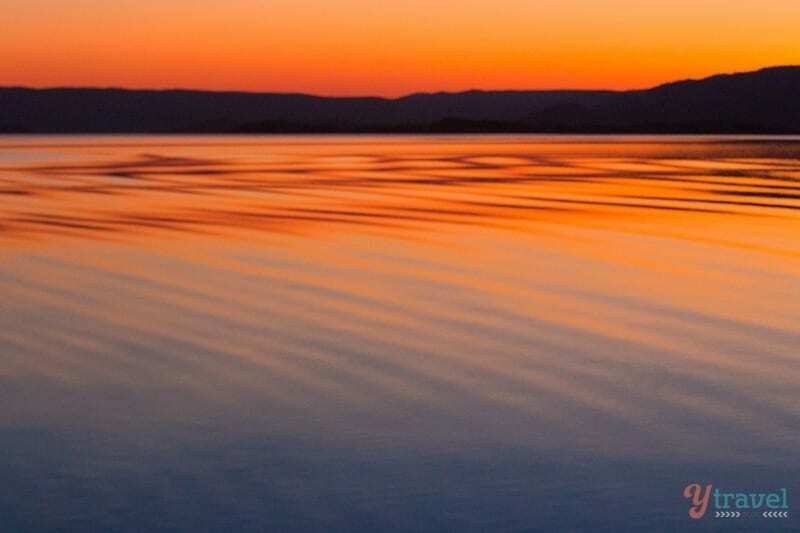 We’d never heard of Lake Argyle until a passing traveller told us it was their favourite place on their whole Australian road trip. What? Where is this place? 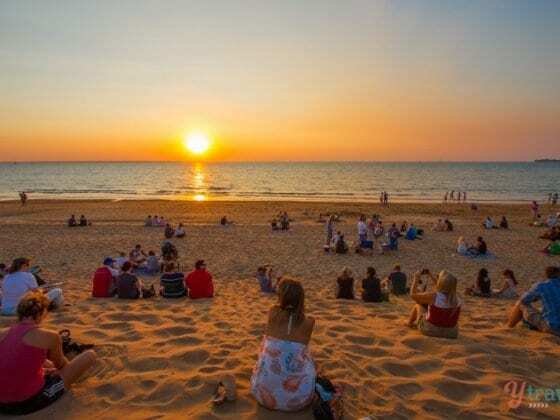 Great Barrier Reef, Ningaloo, Kakadu, Daintree, Uluru the iconic destinations and you choose a place I’ve never heard of. I HAVE to go here. Then our Facebook community started whispering reasons why we should go. 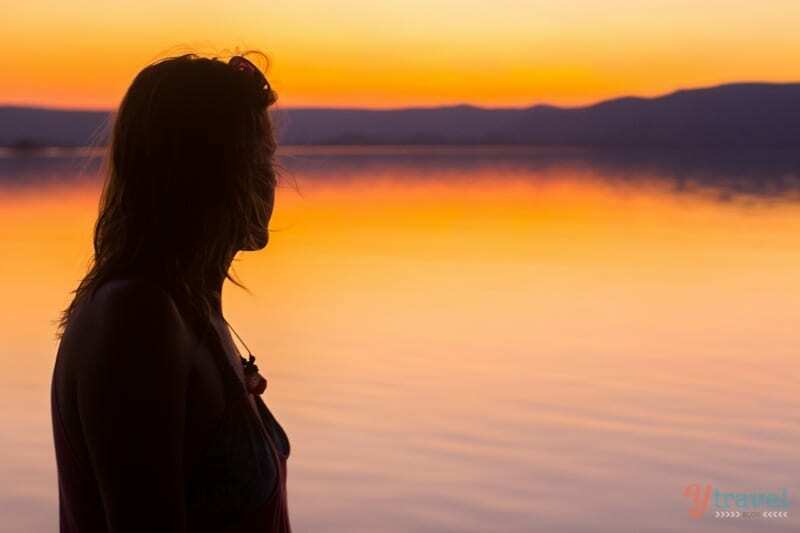 We were devastated that, upon driving to Lake Argyle from the Northern Territory, we heard there was no internet connection and had to divert and stay at Kununurra. Unfortunately, huge deadlines meant we could not go without being offline for such an extended period of time. The challenges of our travel blog business. But, after a hot day at our caravan park in Kununurra we decided to drive out for a dip in their infinity pool – noted as one of the best in Australia. Just so you know, this pool is at the caravan park, not a luxury resort, so it’s accessible to everyone. We arrived hungry, and stopped for some lunch at the cafe attached to the caravan park, opting to wait to look at the pool. But, just as we were about to go to the pool, a spot had opened up and we were asked to join the sunset cruise, with only two minutes to get on the departing bus. We totally missed the infinity pool. But were gifted with something so much more amazing instead. This one random afternoon turned into a memory that we’ll talk about for the rest of our lives. 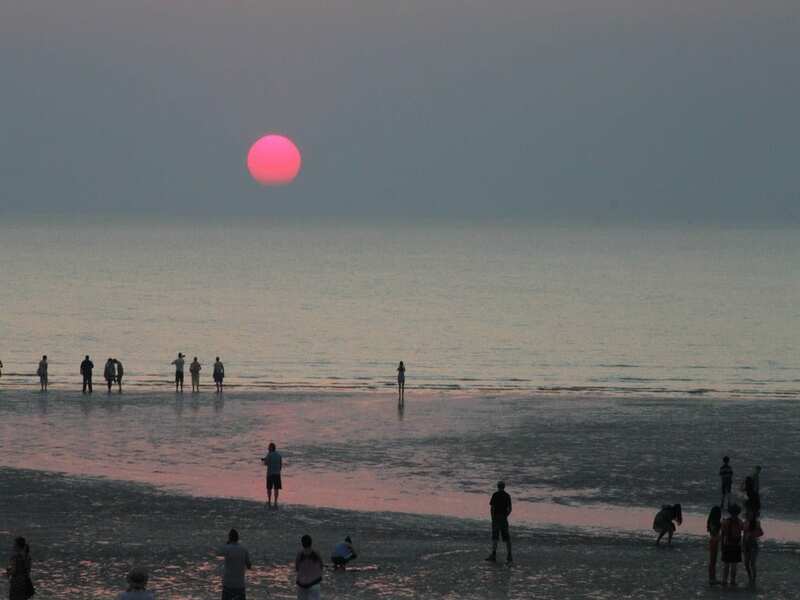 Not just by the tour and the incredible sunset experience, but by water – the immensity and intensity of it. After two hours of cruising past the Bay of Islands, and miles of water and cliffs our tour guide Josh rolled out a map to show how much of the lake we had covered. He had warned us, that at this time of the year, at the end of the dry season, it was low and only the size of 11 Sydney Harbours. I thought we must have covered almost all of that on the cruise, but the map showed us we had only touched just under a third! Wowee. 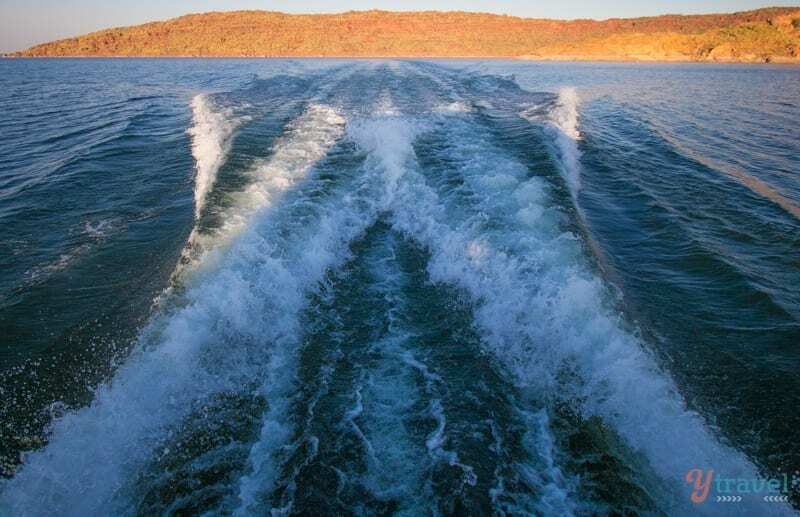 Lake Argyle is a man-made lake created by the damming of the Ord River for an irrigation scheme. 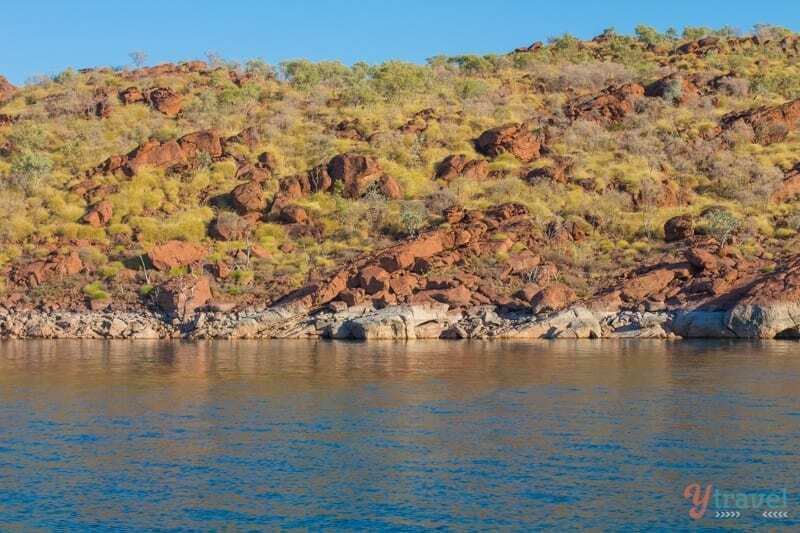 Visit here to get an understanding of the amount of water that falls in the Top End of Australia. It blows my mind after growing up in an area of Australia that is on constant water restrictions. 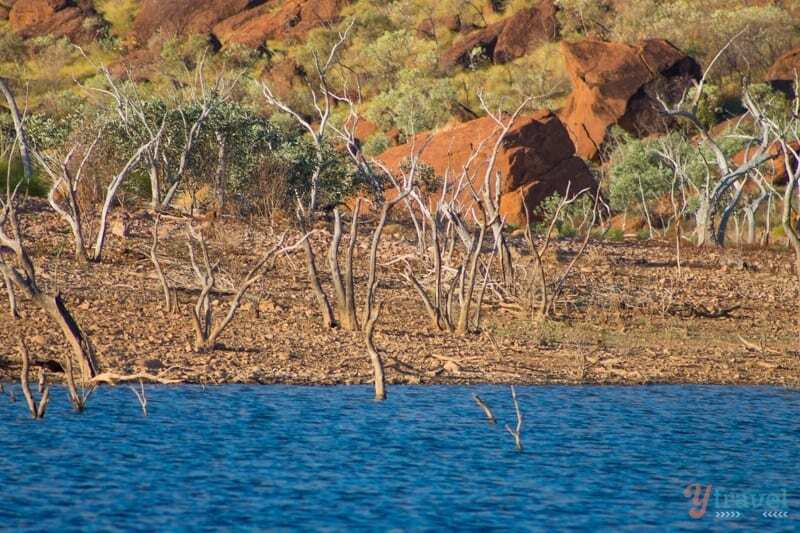 Every second, water equivalent to what the whole of Australia uses in a day is passed through the turbines that power the electricity in the Ord River area. I had such a feeling of peace and a returning to home. Craig and I lived in the other end of the Kimberley region in 2004 working on a Paspaley pearl farm. The magic of this region runs so strong in my veins. It’s a place where there is no right or wrong, no striving or competition, no cares or problems, it’s just a sense of being in the right place. The landscape here is over 600 million years old. That is perfection and I welcome the privilege of being a part of it. It makes me feel safe because no matter the impermanence of my own life, I can turn to those golden mountains and understand strength and power. When you’re here in this perfect isolation you never have to fear or dread that the world will give you anything but perfection. The light dimmed as we cruised back to the jetty and the sunset and ripple effects of the water put on an amazing show. I just hope that you don’t have to plan your trip around internet connection. If you have that freedom then please stay just a little while longer at Lake Argyle. Go swim with crocodiles, soak up that infinity pool and the magic of this special part of a special region of the world. You might just not want to leave. P.S. DON’T EVER swim where SALTWATER crocodiles are! Click here to read more about our dangerous animals. Your post tapped into one of the things that I’m wary of with Australia: the creatures there that want to kill me! BUT I didn’t realise there was a difference between saltwater and freshwater crocodiles and that this difference can affect their behaviour around humans. I’m going to Google this to find out more! I did not know the facts about fresh water crocodiles, but the pics of the setting sun and the mountains were breath taking. 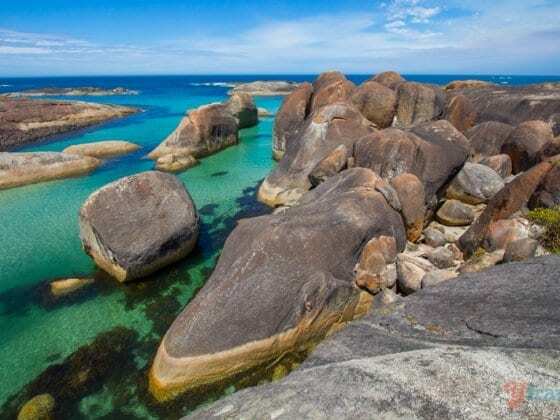 Australia has a very beautiful natural landscape. 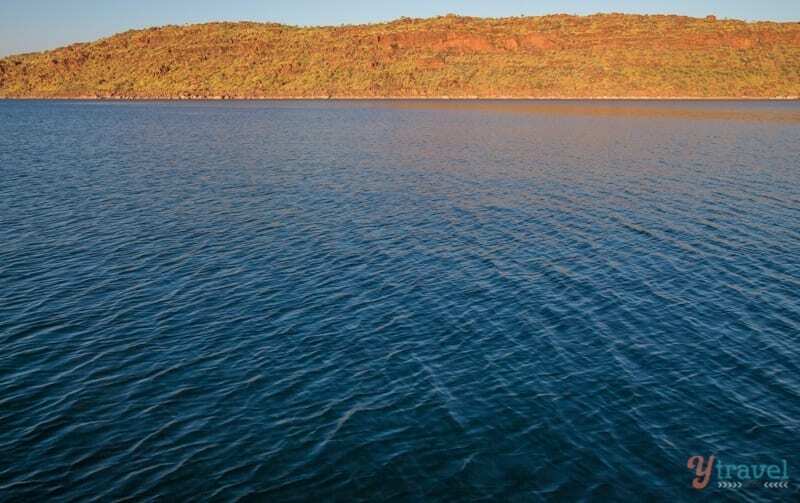 Wow, Lake Argyle is awesome! I’ve been there aswell… Did you go to the caravan park there, with that awesome infinity Pool? The best Pool view I’ve ever had! Incredible photos, again. I didn’t know there were freshies in Lake Argyle, unreal. Thanks for some further inspiration! Awesome, I will put it on my list! Beth.